1. Finer mesh resolution typically result in faster ice mass loss projections from ice sheet models, and this is particularly true for models of the Thwaites Gateway, and I note that DeConto & Pollards mesh could be finer if they had access to more computational power. 2. If I am correct that once the residual Thwaites Ice Tongue is cleared away (maybe within 5 to 20 years), that ice cliff calved icebergs will be able to float-out by traveling along the seafloor trench at the base of the Thwaites Ice Tongue, then an MICI mechanism should be able to develop for the Thwaites Glacier prior to the development of hydrofracturing in this area. 3. As climate change is currently increasing the frequency of cyclones in the Amundsen-Bellingshausen Sea Sector, increased storm surge activity will likely accelerate ice mass loss from this area. 4. The recently observed trend of accelerating ice flow velocities for both the Thwaites, and Pine Island, Glaciers (partially attributable to the loss of buttressing on the SW Tributary Glacier in 2018), results in increased friction-induced ice melting within the body of these glaciers; and such ice meltwater drips/rains down to create increased subglacial meltwater; which serves to accelerate the destabilization of such key marine glaciers. 5. The glacial beds for the WAIS marine glaciers are all more worn/scoured than was the case for all paleo-cases. Thus, any ice mass models calibrated using paleo-data will consequently err on the side of least drama. 6. It is likely that glacial isostatic rebound will increase geothermal heat flux through the beds of key WAIS marine glaciers; which would serve to accelerate the destabilization of such glaciers. 7. Projections of increased snowfall in the coastal regions of the WAIS (with continued global warming), will increase the gravitational driving force associated with MICI and MISI ice mass loss in coming decades. 8. Projections of increased El Nino activity (with continued global warming) will increase the volume of warm CDW advected to the grounding lines of key WAIS marine glaciers, and will also increase the likelihood of hydrofracturing of key WAIS ice shelves in the coming decades. 9. DeConto & Pollard (& Hansen) used consensus values of ECS in their model projections; which indicates that their projections of ice mass loss err on the side of least drama. 10. The Eastern Thwaites Ice Shelf and the Pine Island Ice Shelf, both appear to be degrading faster than projected by DeConto & Pollard; which indicates that their ice mass loss projections err on the side of least drama. 11. The freshening of much of the surface waters of the Southern Ocean, due to both early ice mass loss from Antarctic ice shelves and increase precipitation onto the surface of the Southern Ocean, is accelerating the projected increased upwelling of warm CDW. 12. The early ice mass loss from the Greenland Ice Sheet is accelerating the bipolar seesaw mechanism, which is compounding the influence of the decadal slow down of the MOC. 13. At some point, sufficient ice mass loss from the WAIS will trigger increased seismic and volcanic activity, not evaluated by DeConto & Pollard. 14. Recent evidence indicates that the negative forcing associated with anthropogenic aerosols has been/is greater than previously assumed by consensus climate science; which implies that GMSTA will increase faster than projected as anthropogenic aerosol emissions are reduced and/or redistributed around the globe. Title: "The Carbon Brief Interview: Prof Jonathan Bamber"
On Arctic permafrost: “When it melts, we believe most of that carbon will be emitted as methane, which is a much stronger greenhouse gas than CO2.”"
Abstract: "Arguably among the most globally impactful climate changes in Earth's past million years are the glacial terminations that punctuated the Pleistocene epoch. With the acquisition and analysis of marine and continental records, including ice cores, it is now clear that the Earth's climate was responding profoundly to changes in greenhouse gases that accompanied those glacial terminations. But the ultimate forcing responsible for the greenhouse gas variability remains elusive. The oceans must play a central role in any hypothesis that attempt to explain the systematic variations in pCO2 because the Ocean is a giant carbon capacitor, regulating carbon entering and leaving the atmosphere. For a long time, geological processes that regulate fluxes of carbon to and from the oceans were thought to operate too slowly to account for any of the systematic variations in atmospheric pCO2 that accompanied glacial cycles during the Pleistocene. Here we investigate the role that Earth's hydrothermal systems had in affecting the flux of carbon to the ocean and ultimately, the atmosphere during the last glacial termination. We document late glacial and deglacial intervals of anomalously old 14C reservoir ages, large benthic-planktic foraminifera 14C age differences, and increased deposition of hydrothermal metals in marine sediments from the eastern equatorial Pacific (EEP) that indicate a significant release of hydrothermal fluids entered the ocean at the last glacial termination. The large 14C anomaly was accompanied by a ~4-fold increase in Zn/Ca in both benthic and planktic foraminifera that reflects an increase in dissolved [Zn] throughout the water column. Foraminiferal B/Ca and Li/Ca results from these sites document deglacial declines in [ ] throughout the water column; these were accompanied by carbonate dissolution at water depths that today lie well above the calcite lysocline. Taken together, these results are strong evidence for an increased flux of hydrothermally-derived carbon through the EEP upwelling system at the last glacial termination that would have exchanged with the atmosphere and affected both Δ14C and pCO2. These data do not quantify the amount of carbon released to the atmosphere through the EEP upwelling system but indicate that geologic forcing must be incorporated into models that attempt to simulate the cyclic nature of glacial/interglacial climate variability. Importantly, these results underscore the need to put better constraints on the flux of carbon from geologic reservoirs that affect the global carbon budget." Caption for the attached image: "Figure 1. Nearly pure CO2 bubbles emanating from sediments that blanket an active hydrothermal system in the western tropical Pacific. Photos by Roy Price, courtesy of Jan Amend." The Arctic Ocean is projected to become seasonally ice‐free before midcentury unless greenhouse gas emissions are rapidly reduced, but exactly when this could occur depends considerably on internal climate variability. Here we show that trajectories to an ice‐free Arctic are modulated by concomitant shifts in the Interdecadal Pacific Oscillation (IPO). Trajectories starting in the negative IPO phase become ice‐free 7 years sooner than those starting in the positive IPO phase. Trajectories starting in the negative IPO phase subsequently transition toward the positive IPO phase, on average, with an associated strengthening of the Aleutian Low, increased poleward energy transport, and faster sea‐ice loss. The observed IPO began to transition away from its negative phase in the past few years. If this shift continues, our results suggest increased likelihood of accelerated sea‐ice loss over the coming decades, and an increased risk of an ice‐free Arctic within the next 20–30 years. Manmade climate change is causing a rapid loss of Arctic sea ice. Summer Arctic sea ice is predicted to disappear almost completely by the middle of this century, unless emissions of greenhouse gases are rapidly reduced. The speed of sea‐ice loss is not constant over time, however. Natural climate variability can add to the manmade decline, leading to faster sea‐ice loss, or can subtract from the manmade decline, leading to slower sea‐ice loss. In this study, we looked at how natural climate variability affects the timing of an ice‐free Arctic. We found that a natural cycle called the Interdecadal Pacific Oscillation, or IPO for short, is particularly important. Arctic sea‐ice loss is faster when the IPO is moving from its cold to warm phase and slower when the IPO is moving from its warm to cold phase. This is because variations in the IPO cause changes in atmospheric wind patterns, which alter the amount of heat that is transported into the Arctic. Observations show that the IPO started to shift from its cold to warm phase in the past few years. If this shift continues, our results suggest that there is an increased chance of accelerated sea‐ice loss over the coming decades. Abstract: "The top 2000 m of the Southern Ocean has freshened and warmed over recent decades. However, the high-latitude (south of 50°S) southeast Pacific was observed to be cooler and fresher in the years 2008-2010 compared to 2005-2007 over a wide depth range including surface, mode, and intermediate waters. The causes and impacts of this event are analyzed using the ocean—sea-ice data-assimilating Southern Ocean State Estimate (SOSE) and observationally based products. In 2008-2010, a strong positive Southern Annular Mode coincided with a negative El Niño Southern Oscillation and a deep Amundsen Sea Low. Enhanced meridional winds drove strong sea ice export from the eastern Ross Sea, bringing large amounts of ice to the Amundsen Sea ice edge. In 2008, together with increased precipitation, this introduced a strong freshwater anomaly that was advected eastward by the Antarctic Circumpolar Current (ACC), mixing along the way. This anomaly entered the ocean interior not only as Antarctic Intermediate Water, but also as lighter Southeast Pacific Subantarctic Mode Water (SEPSAMW). A numerical particle release experiment carried out in SOSE , showed that the Ross Sea sector was the dominant source of particles reaching the SEPSAMW formation region. This suggests that large-scale climate fluctuations can induce strong interannual variability of volume and properties of SEPSAMW. These fluctuations act at different time scales: instantaneously via direct forcing, and also lagged over advective time scales of several years from upstream regions." Changes in rainfall variability of El Niño–Southern Oscillation (ENSO) are investigated under scenarios where the greenhouse gases (GHGs) increase and then stabilize. During the period of increasing greenhouse forcing, the ocean mixed layer warms rapidly. After the forcing stabilizes, the deeper ocean continues to warm the surface (the slow response). We show that ENSO rainfall variability over the tropical Pacific intensifies in both periods but the rate of increase per degree global mean surface temperature (GMST) warming is larger for the slow response because of greater relative warming in the base state as the mean upwelling changes from a damping to a driver of the surface warming. Our results have important implications for climate extremes under GMST stabilization that the Paris Agreement calls for. To stabilize GMST, the fast surface cooling offsets the slow warming from the prior GHG increase, while ENSO rainfall variability would continue to increase. The Paris Agreement calls for limiting global mean surface temperature (GMST) increase to well below 2 degrees at the end of the 21st century. This requires the greenhouse gas (GHG) concentration to peak and subsequently decline in next few decades. After the GHG concentration peak, the heat accumulated in the ocean surface layer continues to penetrate to the deeper ocean. This deeper ocean warming leads to a slow response of surface warming, further influencing the climate system. This study examines scenarios where GHGs increase and then stabilize to isolate the fast and slow responses of El Niño‐Southern Oscillation (ENSO) rainfall variability. We find intensification of ENSO rainfall variability both during the increase and after stabilization of GHG concentrations due to a persistent El Niño‐like mean warming pattern in the tropical Pacific. Furthermore, for unit GMST increase, the changes in the mean state temperature and ENSO rainfall variability in the eastern equatorial Pacific is larger during the slow response. These results imply that there is a need for GHG emission reduction in near future to avoid more extreme tropical rainfall during El Niño. Abstract: "We quantify the impact of atmospheric transport and limited marine boundary layer sampling on changes in global and regional CH4 burdens estimate using tracer transport model simulations with annually repeating CH4 emissions and sinks, but varying atmospheric transport patterns. We find the 1σ error due to the transport‐sampling effect on annual global CH4 increases to be 1.11 ppb/yr and on zonal growth rates to be 3.8 ppb/yr, indicating the transport‐sampling effect becomes more critical at smaller spatiotemporal scales. We also find that the trends in inter‐hemispheric and inter‐polar difference of CH4 are significantly influenced by transport‐sampling. Contrary to a negligible trend in the inter‐hemispheric difference of measurements, we find, after adjusting for the transport‐sampling, a trend of 0.37 ± 0.06 ppb/yr. This is consistent with the emission trend from a 3D inversion of the measurements, suggesting a faster increase in emissions in the Northern Hemisphere than in the Southern Hemisphere." Title: "Scientists Track the Source of Soot That Speeds Arctic Melt"
Extract: "Research has found that black carbon emissions may be responsible for as much as half a degree Celsius of Arctic warming — that's about a quarter of the warming the Arctic has experienced over the last hundred years. Recent research has warned that unless global greenhouse gas emissions begin falling substantially within the next decade or two, winter temperatures in the Arctic could skyrocket by more than 10 C."
Zheng, J., Zhang, Q., Li, Q., Zhang, Q., and Cai, M.: Contribution of sea ice albedo and insulation effects to Arctic amplification in the EC-Earth Pliocene simulation, Clim. Past, 15, 291-305, https://doi.org/10.5194/cp-15-291-2019, 2019. In the present work, we simulate the Pliocene climate with the EC-Earth climate model as an equilibrium state for the current warming climate induced by rising CO2 in the atmosphere. The simulated Pliocene climate shows a strong Arctic amplification featuring pronounced warming sea surface temperature (SST) over the North Atlantic, in particular over the Greenland Sea and Baffin Bay, which is comparable to geological SST reconstructions from the Pliocene Research, Interpretation and Synoptic Mapping group (PRISM; Dowsett et al., 2016). To understand the underlying physical processes, the air–sea heat flux variation in response to Arctic sea ice change is quantitatively assessed by a climate feedback and response analysis method (CFRAM) and an approach similar to equilibrium feedback assessment. Given the fact that the maximum SST warming occurs in summer while the maximum surface air temperature warming happens during winter, our analyses show that a dominant ice-albedo effect is the main reason for summer SST warming, and a 1 % loss in sea ice concentration could lead to an approximate 1.8 W m−2 increase in shortwave solar radiation into open sea surface. During the winter months, the insulation effect induces enhanced turbulent heat flux out of the sea surface due to sea ice melting in previous summer months. This leads to more heat released from the ocean to the atmosphere, thus explaining why surface air temperature warming amplification is stronger in winter than in summer. Abstract: "In the warming world, tropical Pacific sea surface temperature (SST) variation has received considerable attention because of its enormous influence on global climate change, particularly the El Niño-Southern Oscillation process. Here, we provide new high-resolution proxy records of the magnesium/calcium ratio and the oxygen isotope in foraminifera from a core on the Ontong-Java Plateau to reconstruct the SST and hydrological variation in the center of the Western Pacific Warm Pool (WPWP) over the last 360 000 years. In comparison with other Mg/Ca-derived SST and δ18O records, the results suggested that in a relatively stable condition, e.g., the last glacial maximum (LGM) and other glacial periods, the tropical Pacific would adopt a La Niña-like state, and the Walker and Hadley cycles would be synchronously enhanced. Conversely, El Niño-like conditions could have occurred in the tropical Pacific during fast changing periods, e.g., the termination and rapidly cooling stages of interglacial periods. In the light of the sensitivity of the Eastern Pacific Cold Tongue (EPCT) and the inertia of the WPWP, we hypothesize an inter-restricted relationship between the WPWP and EPCT, which could control the zonal gradient variation of SST and affect climate change." Title: "Some Arctic ground no longer freezing—even in winter"
Extract: "On January 16, 2019, a new global study published in Nature Communications confirmed that permafrost is thawing quickly across much of the world. Between 2007 and 2016, permafrost temperature increased by 0.29 ± 0.12 °C globally. The greatest warming was seen in parts of Siberia, up to 0.93 °C. Significant warming was also seen in Antarctica, and less in mountain regions. In much of the Arctic ground temperature increased because of rising average air temperatures, while increased snow thickness in some areas also contributed to warming the ground underneath." Title: "Arctic sea ice loss in the past linked to abrupt climate events"
Extract: "A new study on ice cores shows that reductions in sea ice in the Arctic in the period between 30-100,000 years ago led to major climate events. During this period, Greenland temperatures rose by as much as 16 degrees Celsius. "The summer time sea ice in the Arctic has experienced a 40% decline in the last few decades, but we know that about two thirds of that reduction is caused by human-induced climate change. What we now need to determine is, what can be learnt from these past sea ice losses to enable us to understand what might happen next to our climate."" Abstract: "Greenland ice cores provide excellent evidence of past abrupt climate changes. However, there is no universally accepted theory of how and why these Dansgaard–Oeschger (DO) events occur. Several mechanisms have been proposed to explain DO events, including sea ice, ice shelf buildup, ice sheets, atmospheric circulation, and meltwater changes. DO event temperature reconstructions depend on the stable water isotope (δ18O) and nitrogen isotope measurements from Greenland ice cores: interpretation of these measurements holds the key to understanding the nature of DO events. Here, we demonstrate the primary importance of sea ice as a control on Greenland ice core δ18O: 95% of the variability in δ18O in southern Greenland is explained by DO event sea ice changes. Our suite of DO events, simulated using a general circulation model, accurately captures the amplitude of δ18O enrichment during the abrupt DO event onsets. Simulated geographical variability is broadly consistent with available ice core evidence. We find an hitherto unknown sensitivity of the δ18O paleothermometer to the magnitude of DO event temperature increase: the change in δ18O per Kelvin temperature increase reduces with DO event amplitude. We show that this effect is controlled by precipitation seasonality. Title: "Abrupt changes in climate and ice sheets during glacial-interglacial cycles"
Understanding how and why rapid environmental changes took place in the Quaternary remains a key challenge in the field of climate science. In particular, it remains difficult to reconcile the chain of events between recorded warming, cooling, iceberg calving, ice sheet melt and sea level rise. Many of these events have been linked with changing greenhouse gases, collapsing ice sheets and rapid reorganisations of ocean circulation. However, the fundamental questions remain: How can progressive climate trends trigger rapid changes? What are the internal instabilities and ice-ocean-atmosphere interactions that drove the sudden transitions? Are they stochastic responses in a variable Earth System or are the processes consistent across glacial-interglacial cycles? What was their environmental impact? For this session, we invite contributions that seek to better constrain the chain of events surrounding abrupt changes in climate and ice sheets during glacial-interglacial cycles. We encourage submissions covering mechanistic-modelling, data acquisition and reconstructions of the events and their impact. Title: "Abrupt climate changes: The view from lakes"
The Earth’s climate system has experienced a series of abrupt changes during the recent geological past. Abrupt climate changes occurring on centennial to multi-decadal scales could provide an analogue for what might happen with future global warming, thus have attracted increasing attention from paleoclimatologists. In this regard, lake records are of special importance due to the fact that they contain a diverse selection of proxies, respond sensitively to climate change and are highly resolved and geographically widespread. This session invites contributions of newly obtained high-resolution, multi-proxy data from lake sediments, to allow for the exchange of the latest results and ideas regarding changes in hydrology, ecology and climate recorded by lakes at different latitudes during the late Quaternary. This session will aim to identify the regional expression of different abrupt climate changes occurring in the past, thereby progressing our understanding of the mechanisms responsible for abrupt climate changes on different timescales and the possible environmental effects of future global warming in different regions. Title: "Study: Climate change reshaping how heat moves around globe"
Extract: " This is the first study to examine current changes in heat transfer and to conclude that warming temperatures are driving increased heat transfer in the atmosphere, which is compensated by a reduced heat transfer in the ocean. Additionally, the researchers concluded that the excess oceanic heat is trapped in the Southern Ocean around the Antarctic." Extract: "... the researchers concluded that the excess oceanic heat is trapped in the Southern Ocean around the Antarctic." Much of what ASLR posts is sobering (when I understand it). This sentence suggests to me that Antarctic glaciers are doomed (not as if they weren't doomed previously), and like what ASLR regularly posts, there will be "more rapid climate change than expected by consensus climate science". Much of what ASLR posts is sobering (when I understand it). a) The modern rate of radiative forcing is many times that of the paleo record, which is like moving the domino tiles closer together so that they are more likely to cascade. b) Many of the 'slow response' feedback mechanisms have components that can be activated on the timescale of decades, even if the average response occurs on a timescale of centuries to millennia. c) Many measures of consensus climate sensitivity based on observed data have been distorted by incorrect models and by ignoring the effects of various masking factors. d) Ice-climate feedback mechanisms as considered by James Hansen (including ice feedback interactions with ENSO, MOC, Arctic Amplification, etc.). e) Climate sensitivity should be redefined to mean more than just the likely increasing in GMSTA for a doubling of radiative forcing, to include such factors as: increasing climate variability, increasing storm intensity/frequency, changes in precipitation patterns, etc. Accepting the consensus range for the likely value of climate sensitivity may be comforting, but it can lead to the adoption of ineffective climate counter measures. Previdi, M., B.G. Liepert, D. Peteet, J. Hansen, D.J. Beerling, A.J. Broccoli, S. Frolking, J.N. Galloway, M. Heimann, C. Le Quéré, S. Levitus, and V. Ramaswamy, 2013: Climate sensitivity in the Anthropocene. Q. J. Roy. Meteorol. Soc., 139, 1121-1131, doi:10.1002/qj.2165. Abstract: "Climate sensitivity in its most basic form is defined as the equilibrium change in global surface temperature that occurs in response to a climate forcing, or externally imposed perturbation of the planetary energy balance. Within this general definition, several specific forms of climate sensitivity exist that differ in terms of the types of climate feedbacks they include. Based on evidence from Earth's history, we suggest here that the relevant form of climate sensitivity in the Anthropocene (e.g. from which to base future greenhouse gas (GHG) stabilization targets) is the Earth system sensitivity including fast feedbacks from changes in water vapour, natural aerosols, clouds and sea ice, slower surface albedo feedbacks from changes in continental ice sheets and vegetation, and climate-GHG feedbacks from changes in natural (land and ocean) carbon sinks. Traditionally, only fast feedbacks have been considered (with the other feedbacks either ignored or treated as forcing), which has led to estimates of the climate sensitivity for doubled CO2 concentrations of about 3°C. The 2×CO2 Earth system sensitivity is higher than this, being ∼4-6°C if the ice sheet/vegetation albedo feedback is included in addition to the fast feedbacks, and higher still if climate-GHG feedbacks are also included. The inclusion of climate-GHG feedbacks due to changes in the natural carbon sinks has the advantage of more directly linking anthropogenic GHG emissions with the ensuing global temperature increase, thus providing a truer indication of the climate sensitivity to human perturbations. The Earth system climate sensitivity is difficult to quantify due to the lack of palaeo-analogues for the present-day anthropogenic forcing, and the fact that ice sheet and climate-GHG feedbacks have yet to become globally significant in the Anthropocene. Furthermore, current models are unable to adequately simulate the physics of ice sheet decay and certain aspects of the natural carbon and nitrogen cycles. Obtaining quantitative estimates of the Earth system sensitivity is therefore a high priority for future work." Title: "Guest post: Land management ‘blind spots’ make 1.5C goal highly unlikely"
Extract: "In a new “perspective” paper, published in Nature Climate Change, my co-authors and I look at the “blind spots” that hinder strategies to cut land-based emissions. These include inconsistent policies, time lags that make rapid change difficult, and detrimental consequences of some mitigation options. As things stand, these blind spots mean that achieving the 1.5C goal – and, perhaps, also even 2C – is highly unlikely. Indeed, the rates of primary forest loss in the DRC and Indonesia are now 1.5 and three-times the rate in Brazil, respectively, and continue to include widespread clearance of carbon-rich peatland." Extract: "Director of National Intelligence Dan Coats in written testimony warned of the potential for "abrupt climate change," marking the first time the former Republican congressman from Indiana has used such loaded language in writing." Global environmental and ecological degradation, as well as climate change, are likely to fuel competition for resources, economic distress, and social discontent through 2019 and beyond. Climate hazards such as extreme weather, higher temperatures, droughts, floods, wildfires, storms, sea level rise, soil degradation, and acidifying oceans are intensifying, threatening infrastructure, health, and water and food security. Irreversible damage to ecosystems and habitats will undermine the economic benefits they provide, worsened by air, soil, water, and marine pollution. - Extreme weather events, many worsened by accelerating sea level rise, will particularly affect urban coastal areas in South Asia, Southeast Asia, and the Western Hemisphere. Damage to communication, energy, and transportation infrastructure could affect low-lying military bases, inflict economic costs, and cause human displacement and loss of life. - Changes in the frequency and variability of heat waves, droughts, and floods—combined with poor governance practices—are increasing water and food insecurity around the world, increasing the risk of social unrest, migration, and interstate tension in countries such as Egypt, Ethiopia, Iraq, and Jordan. - Diminishing Arctic sea ice may increase competition—particularly with Russia and China—over access to sea routes and natural resources. Nonetheless, Arctic states have maintained mostly positive cooperation in the region through the Arctic Council and other multilateral mechanisms, a trend we do not expect to change in the near term. Warmer temperatures and diminishing sea ice are reducing the high cost and risks of some commercial activities and are attracting new players to the resource-rich region. In 2018, the minimum sea ice extent in the Arctic was 25 percent below the 30-year average from 1980 to 2010. - Migration is likely to continue to fuel social and interstate tensions globally, while drugs and transnational organized crime take a toll on US public health and safety. Political turbulence is rising in many regions as governance erodes and states confront growing public health and environmental threats. Coats told lawmakers his opening remarks were intended "to provide you an overview of the national security threats facing our nation." He was the only one to give opening remarks, as he was speaking on behalf of those seated beside him: CIA Director Gina Haspel, FBI Director Christopher Wray, National Security Agency Director Gen. Paul Nakasone, Defense Intelligence Agency Director Gen. Robert Ashley and National Geospatial-Intelligence Agency Director Robert Cardillo. 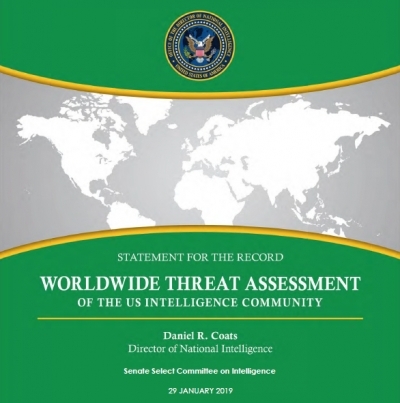 "In many respects, it is a rebuke to the political rhetoric from the administration," John Cohen, a senior Homeland Security official focusing on threat-related intelligence under the Obama administration, and an ABC News contributor, said. "[It's] striking in some respects." ... "what is striking about this detailed assessment is what it doesn't say. ... The report does not reinforce or support recent claims by the administration of a national security crisis at the southern border,"
Trump believes Putin over those guys. While Trump's idea of a 'solution' to our current situation seem to be to model the US socio-economic system after Russia's kleptocracy, there are more promising alternates. Title: "A Centuries-Old Idea Could Revolutionize Climate Policy"
Extract: "Long before he was associated with theatrical hip-hop, former Treasury Secretary Hamilton called for policies that sound familiar to us today. Like Representative Ocasio-Cortez, he wanted massive federal spending on new infrastructure. Like Donald Trump, he believed that very high tariffs can nurture American manufacturing. And like Elizabeth Warren, he was willing to bend the Constitution to reform the financial system. Even its supporters seem to concede that the Green New Deal is a binder of climate policies duct-taped to an Easter basket of socialist goodies: Its individual parts may be great, but you have to admit that it looks like it might teeter over. Its critics, meanwhile, ominously suggest that it prizes ideology above science—something I have also warned of. But both views are, on the whole, incorrect. Ocasio-Cortez’s proposal is not only a set of progressive nice-to-haves, nor is it a full-on assault on capitalism. The Green New Deal has a coherent economic philosophy and a compelling theory of change—and pundits don’t have to like them to bother understanding them. Ocasio-Cortez’s love of industrial policy did not come from nowhere. In the past few years, a group of scholars has revived an old school of economic thought that says a strong manufacturing policy is an absolute necessity for large, developed nations. They argue that the United States has neglected its domestic manufacturing sector since the 1980s, a move that risks national failure." The proposed Presidential Committee on Climate Security, which would be established by executive order, is being spearheaded by William Happer, a National Security Council senior director. Happer, an emeritus professor of physics at Princeton University, has said that carbon emissions linked to climate change should be viewed as an asset rather than a pollutant. The initiative represents the Trump administration’s most recent attempt to question the findings of federal scientists and experts on climate change and comes less than three weeks after Director of National Intelligence Daniel Coats delivered a worldwide threat assessment that identified it as a significant security risk. Princeton Professor William Happer laid out details of an unofficial peer review process run by the Global Warming Policy Foundation (GWPF), a UK climate skeptic think tank and said he could ask to put an oil funded report through a similar review process, after admitting that it would struggle to be published in an academic journal. Abstract: "To predict the future contributions of the Antarctic ice sheets to sea-level rise, numerical models use reconstructions of past ice-sheet retreat after the Last Glacial Maximum to tune model parameters. Reconstructions of the West Antarctic Ice Sheet have assumed that it retreated progressively throughout the Holocene epoch (the past 11,500 years or so). Here we show, however, that over this period the grounding line of the West Antarctic Ice Sheet (which marks the point at which it is no longer in contact with the ground and becomes a floating ice shelf) retreated several hundred kilometres inland of today’s grounding line, before isostatic rebound caused it to re-advance to its present position. Our evidence includes, first, radiocarbon dating of sediment cores recovered from beneath the ice streams of the Ross Sea sector, indicating widespread Holocene marine exposure; and second, ice-penetrating radar observations of englacial structure in the Weddell Sea sector, indicating ice-shelf grounding. We explore the implications of these findings with an ice-sheet model. Modelled re-advance of the grounding line in the Holocene requires ice-shelf grounding caused by isostatic rebound. Our findings overturn the assumption of progressive retreat of the grounding line during the Holocene in West Antarctica, and corroborate previous suggestions of ice-sheet re-advance. Rebound-driven stabilizing processes were apparently able to halt and reverse climate-initiated ice loss. Whether these processes can reverse present-day ice loss on millennial timescales will depend on bedrock topography and mantle viscosity—parameters that are difficult to measure and to incorporate into ice-sheet models." Title: "The West Antarctic Ice Sheet Seems to Be Good at Collapsing"
Extract: "SCIENTISTS HAVE DISCOVERED that the West Antarctic Ice Sheet underwent a major retreat between 10,000 and 12,000 years ago, at a time when the world was actually cooler than it is today. The collapse happened at the close of the last Ice Age, and it left the ice sheet 135,000 square miles smaller than it is today – a difference nearly as large as the state of Montana. “That the ice sheet could retreat beyond where it is today, in a climate that was likely quite a bit colder than today, points to extraordinary sensitivity,” says Robert DeConto, a glaciologist at the University of Massachusetts Amherst, who was not involved in the research." Camille Li, Andreas Born: Coupled atmosphere-ice-ocean dynamics in Dansgaard-Oeschger events, Quaternary Science Reviews, Volume 203, 2019,Pages 1-20,ISSN 0277-3791, doi.org/10.1016/j.quascirev.2018.10.031. Abstract: "The Dansgaard-Oeschger events of the last ice age are among the best studied abrupt climate changes, yet a comprehensive explanation is still lacking. They are most pronounced in the North Atlantic, where they manifest as large temperature swings, on timescales of decades or shorter, between persistent cold (stadial) and warm (interstadial) conditions. This review examines evidence that Dansgaard-Oeschger events are an unforced or “spontaneous” oscillation of the coupled atmosphere-ice-ocean system comprising the North Atlantic, Nordic Seas and Arctic, collectively termed the Northern Seas. Insights from reanalysis data, climate model simulations, and idealized box model experiments point to the subpolar gyre as a key coupling region where vigorous wind systems encounter the southernmost extension of sea ice and the most variable currents of the North Atlantic, with connections to the deep ocean via convection. We argue that, under special conditions, these components can interact to produce Dansgaard-Oeschger events. Finding the sweet spot is a matter of understanding when the subpolar region enters a feedback loop whereby changes in wind forcing, sea ice cover, and ocean circulation amplify and sustain perturbations towards cold (ice-covered) or warm (ice-free) conditions. The resulting Dansgaard-Oeschger-like variability is seen in a handful of model simulations, including some “ugly duckling” pre-industrial simulations: these may be judged as undesirable at the outset, but ultimately show value in suggesting that current models include the necessary physics to produce abrupt climate transitions, but exhibit incorrect sensitivity to the boundary conditions. Still, glacial climates are hypothesized to favour larger, more persistent transitions due to differences in large-scale wind patterns. Simplified models and idealized experimental setups may provide a means to constrain how the critical processes act, both in isolation and in combination, to destabilize the subpolar North Atlantic." Caption: "Fig. 2. Map of the Northern Seas. Purple arrows represent surface currents, dashed orange arrows represent deep currents, and SPG indicates the subpolar gyre. Shading shows annual mean sea surface temperature (blues) and sea ice concentration (greys) from the NOAA Optimum Interpolation version 2 SST reanalysis (Reynolds et al., 2007)." Extract: "Runaway climate change or runaway global warming is hypothesized to follow a tipping point in the climate system, after accumulated climate change initiates a reinforcing positive feedback. This rapid acceleration in climate change may lead to potentially irreversible damage to the climate system, making timely mitigation efforts unfeasible. This is thought to cause the climate to rapidly change until it reaches a new stable condition. These phrases may be used with reference to concerns about rapid global warming." As a follow-on to my last post about 'runaway climate change', I would like to remind regular readers (& inform new readers) that 'super-interglacial' periods are characterized by values of climate sensitivity that are higher than current Earth System Models, ESMs, can project; and the linked sources indicate that for the past 2.8 million years such super-interglacial periods appear to be at least partially triggered by the abrupt collapse of the WAIS, which can push warm water from the Pacific Ocean into the Arctic Ocean basin. Extract: "At least eight times in the last 2.8 million years, the Arctic experienced super-interglacials – periods in which summers there were 5°C warmer than they are today. Climate models cannot explain these unusually warm spells, but there could be an unexpected cause: the collapse of the West Antarctic ice sheet (WAIS), on the other side of the planet. The sheet could collapse again as the world warms, perhaps heralding super-interglacial number nine. Despite being half a world away, the collapse of the ice sheet might be the trigger for an Arctic super-interglacial, says Melles. As the WAIS disintegrates, it would raise global sea levels by about 5 metres. This would push more warm water from the Pacific Ocean through the Bering Strait into the Arctic Ocean, warming the Arctic region. Valdes agrees such a process could well be important, particularly as it was not included in the models he studied last year. So a collapsing WAIS would not just drive up sea levels, it might also heat up the Arctic." Abstract: "Until now, the lack of time-continuous, terrestrial paleoenvironmental data from the Pleistocene Arctic has made model simulations of past interglacials difﬁcult to assess. Here, we compare climate simulations of four warm interglacials at Marine Isotope Stages (MISs) 1 (9ka), 5e (127ka), 11c (409ka) and 31 (1072ka) with new proxy climate data recovered from Lake El’gygytgyn, NE Russia. Climate reconstructions of the mean temperature of the warmest month (MTWM) indicate conditions up to 0.4, 2.1, 0.5 and 3.1◦C warmer than today during MIS 1, 5e, 11c and 31, respectively. While the climate model captures much of the observed warming during each interglacial, largely in response to boreal summer (JJA) orbital forcing, the extraordinary warmth of MIS 11c compared to the other interglacials in the Lake El’gygytgyn temperature proxy reconstructions remains difﬁcult to explain. To deconvolve the contribution of multiple inﬂuences on interglacial warming at Lake El’gygytgyn, we isolated the inﬂuence of vegetation, sea ice and circum-Arctic land ice feedbacks on the modeled climate of the Beringian interior. Simulations accounting for climate–vegetation–land-surface feedbacks during all four interglacials show expanding boreal forest cover with increasing summer insolation intensity. A deglaciated Greenland is shown to have a minimal effect on northeast Asian temperature during the warmth of stages 11c and 31 (Melles et al., 2012). A prescribed enhancement of oceanic heat transport into the Arctic Ocean does have some effect on Lake El’gygytgyn’s regional climate, but the exceptional warmth of MIS l1c remains enigmatic compared to the modest orbital and greenhouse gas forcing during that interglacial." Furthermore, I remind readers that the E3SM (2017 version) had a mean value for ECS (this century) of 5.2C, and that these projections do not consider ice-climate feedbacks from a potential collapse of the WAIS this century. Abstract: "This paper reviews the impacts of permafrost change on hydrological and related hydrochemical, particulate and organic fluxes in small Arctic catchments. While the emphasis is directed at High Arctic systems, literature and recent developments from other Arctic regions are also included. Hydrological change, particularly a shift from nival (snowmelt) dominance to increasing pluvial (rainfall) runoff contributions has important consequences for the timing and magnitude of hydrological fluxes. A key distinction is made between thermal perturbation, where changing melt season thaw conditions result in deep thaw with minimal geomorphic or surface hydrological effects, in contrast to physical perturbation, where permafrost change results in some form of thermokarst or physical disturbance such as mass movement or enhanced erosion. The latter disturbances are commonly expressed as localized thermo erosional gullies, active layer detachments and retrogressive thaw slumps. Results from recent research emphasise the importance of hydrological connectivity in terms of the downstream effect of a particular permafrost perturbation. Well-connected systems, either at the surface as channelized flows, or in the subsurface, through new or altered active layer flow pathways, result in substantial changes in downstream fluvial fluxes. Surface hydrological connectivity of localized permafrost disturbances increases transport of suspended sediment and particulate organic matter, the latter of which is often old and comparatively labile. Exposed ice in retrogressive thaw slumps sustains discharge during the melt season, further increasing fluxes. Thermal perturbation holds a substantially greater potential downstream impact due to widespread mobilization of solutes and dissolved organic carbon and nitrogen, and several studies point to rapid microbial alteration of carbon and inorganic nitrogen transformation in the shallow subsurface. Collectively, these results point to altered runoff, sediment transport and hydrochemical fluxes with spatial and hydrological controls." Schannwell, C., Drews, R., Ehlers, T. A., Eisen, O., Mayer, C., and Gillet-Chaulet, F.: Kinematic response of ice-rise divides to changes in oceanic and atmospheric forcing, The Cryosphere Discuss., https://doi.org/10.5194/tc-2019-26, in review, 2019. Abstract. The majority of Antarctic ice shelves are bounded by grounded ice rises. These ice rises exhibit local flow regimes that partially oppose the flow of the surrounding ice shelves. Formation of such ice rises is accompanied by a characteristic upward arching internal stratigraphy (Raymond arches), archiving potential past divide migration and the onset of divide flow. Information about past ice-sheet conditions can therefore be retrieved in areas where other archives are missing. However, the quantitative interpretation of the stratigraphy requires modelling and radar observations. Hitherto, ice-rise modelling has been restricted to 2D and excluded the coupling between ice shelf and ice rise. This presents a major limitation for the interpretation of ice rises as ice-dynamic archive. Here we present an improved modelling framework to study ice-rise evolution using a calibrated, isothermal, and isotropic 3D Full-Stokes model including grounding-line dynamics at the required mesh resolution (<500 m). We apply the model to the Ekström Ice Shelf catchment containing two ice rises. Our results show that changes in the surface mass balance result in immediate and sustained divide migration (>2.0 m/yr) of up to 3.5 km. In contrast, instantaneous ice-shelf disintegration causes a short-lived and delayed (by 60–100 years) response of smaller magnitude (<0.75 m/yr). The model tracks migration of a triple junction and synchronous ice-divide migration in both ice rises with similar magnitude but differing rates. The model is suitable for glacial/interglacial simulations on the catchment scale, providing the next step forward to unravel the ice-dynamic history stored in ice rises all around Antarctica. Caption for first image: "Figure 1. (a) Location map of ice rises along the margin of the Antarctic ice sheet (Matsuoka et al., 2015). The base map combines ice velocity of the ice sheet (Rignot et al., 2011) and the bathymetry of the adjacent ocean regions (Arndt et al., 2013). Blue rectangle shows zoom-in area of (b). (b) Radarsat image (Jezek and 5 RAMP-Product-Team:, 2002) of the study area with locations mentioned in the main text. Caption for second image: " Figure2.Upperpanel(a-c) shows schematic steady state (a), divide migration induced by asymmetric surface mass balance forcing (b), and by ocean perturbation forcing (c). Buttressing in (c) is asymmetric. Solid red arrows indicate approximate ice ﬂow path from ice-rise divide to ice shelf. Grey dashed lines in (b, c) display steady state geometry and divide position of (a).GL=grounding line. Lower panel (d-f) shows schematic of expected internal stratigraphy for steady state (d), fast migration (e), and slow migration (f)." Todd, J., Christoffersen, P., Zwinger, T., Råback, P., and Benn, D. I.: Sensitivity of calving glaciers to ice-ocean interactions under climate change: New insights from a 3D full-Stokes model, The Cryosphere Discuss., https://doi.org/10.5194/tc-2019-20, in review, 2019. Abstract. Iceberg calving accounts for between 30–60 % of net mass loss from the Greenland Ice Sheet, which has intensified and is now the single largest contributor to global sea level rise in the cryosphere. Changes to calving rates and the dynamics of calving glaciers represent one of the largest uncertainties in projections of future sea level rise. A growing body of observational evidence suggests that calving glaciers respond rapidly to regional environmental change, but predictive capacity is limited by the lack of suitable models capable of simulating the calving mechanism realistically. Here, we use a 3D full-Stokes calving model to investigate the environmental sensitivity of Store Glacier, a large outlet glacier in West Greenland. We focus on two environmental processes: undercutting by submarine melting and buttressing by ice mélange, and our results indicate that Store Glacier is likely to be able to withstand moderate warming perturbations in which the former is increased by 50 % and the latter reduced equivalently. However, severe perturbation with a doubling of submarine melt rates or a complete loss of ice mélange destabilizes the calving front in our model runs. Furthermore, our analysis reveals that stress and fracture patterns at Store’s terminus are complex and varied, primarily due to the influence of basal topography. Calving style and environmental sensitivity varies greatly, with propagation of surface crevasses significantly influencing iceberg production in the northern side, whereas basal crevasses dominate in the south. Any future retreat is likely to be initiated in the southern side by a combination of increased melt rate in summer and reduced mélange strength in winter. The lateral variability, as well as the importance of rotational and bending forces at the terminus, underlines the importance of using the 3D full-Stokes stress solution when modelling Greenland’s calving glaciers. Abyssal ocean warming contributed substantially to anthropogenic ocean heat uptake and global sea level rise between 1990 and 2010. In the 2010s, several hydrographic sections crossing the South Pacific Ocean were occupied for a third or fourth time since the 1990s, allowing for an assessment of the decadal variability in the local abyssal ocean properties among the 1990s, 2000s, and 2010s. These observations from three decades reveal steady to accelerated bottom water warming since the 1990s. Strong abyssal (z > 4000 m) warming of 3.5 (±1.4) m°C yr‐1 (m°C=10‐3 °C) is observed in the Ross Sea, directly downstream from bottom water formation sites, with warming rates of 2.5 (±0.4) m°C yr‐1 to the east in the Amundsen‐Bellingshausen Basin and 1.3 (±0.2) m°C yr‐1 to the north in the Southwest Pacific Basin, all associated with a bottom‐intensified descent of the deepest isotherms. Warming is consistently found across all sections and their occupations within each basin, demonstrating the abyssal warming is monotonic, basin‐wide, and multi‐decadal. In addition, bottom water freshening was strongest in the Ross Sea, with smaller amplitude in the Amundsen‐Bellingshausen Basin in the 2000s, but is discernible in portions of the Southwest Pacific Basin by the 2010s. These results indicate that bottom water freshening, stemming from strong freshening of Ross Shelf Waters, is being advected along deep isopycnals and mixed into deep basins, albeit on longer timescales than the dynamically driven, wave‐propagated warming signal. We quantify the contribution of the warming to local sea level and heat budgets. Over 90% of the excess energy gained by Earth's climate system has been absorbed by the oceans, with about 10% found deeper than 2000 m. The rates and patterns of deep and abyssal (deeper than 4000 m) ocean warming, while vital for understanding how this heat sink might behave in the future, are poorly known owing to limited data. Here we use highly accurate data collected by ships along oceanic transects with decadal revisits to quantify how much heat and freshwater has entered the South Pacific Ocean between the 1990s and 2010s. We find widespread warming throughout the deep basins there, and evidence that the warming rate has accelerated in the 2010s relative to the 1990s. The warming is strongest near Antarctica where the abyssal ocean is ventilated by surface waters that sink to the sea floor and hence become bottom water, but abyssal warming is observed everywhere. In addition, we observe an infusion of freshwater propagating along the pathway of the bottom water as it moves northward from Antarctica. We quantify the deep ocean warming contributions to heat uptake as well as sea level rise through thermal expansion. Abstract: "Variability in the strength of low-cloud feedbacks across climate models is the primary contributor to the spread in their estimates of equilibrium climate sensitivity (ECS). This raises the question: What are the regional implications for key features of tropical climate of globally weak versus strong low-cloud feedbacks in response to greenhouse gas induced warming? To address this question and formalize our understanding of cloud controls on tropical climate, we perform a suite of idealized fully-coupled and slab-ocean climate simulations across which we systematically scale the strength of the low-cloud-cover feedback under abrupt 2xCO2 forcing within a single model, thereby isolating the impact of low-cloud feedback strength. The feedback strength is varied by modifying the stratus cloud fraction so that it is a function of not only local conditions but also global temperature in a series of abrupt 2xCO2 sensitivity experiments. The unperturbed decrease in low cloud cover (LCC) under 2xCO2 is greatest in the mid- and high-latitude oceans, and subtropical eastern Pacific and Atlantic, a pattern that is magnified as the feedback strength is scaled. Consequently, sea surface temperature (SST) increases more in these regions as well as the Pacific cold tongue. As the strength of the low-cloud feedback increases this results in not only increased ECS, but also an enhanced reduction of the large-scale zonal and meridional SST gradients (structural climate sensitivity), with implications for the atmospheric Hadley and Walker Circulations, as well as the hydrological cycle. The relevance of our results to simulating past warm climate is also discussed." Thanks for the link to Purkey, i always read her. I note that Johnson is on this one too, and some of the usual suspects. Pity ARGO don't go that deep. Yet. I hope she's doing one on the whole southern hemisphere, rather than just the Pacific. contributor to ocean heat uptake and SLR." That bit about recent freshening in the southwest pacific might be linked to Totten and neighbours. 1. We are rapidly approaching GMSTA conditions similar to point 'B' (for the Eemian) in the first image; and per the IPCC report on the 1.5C aspirational goal, within a few years we are almost certain to reach this value of GMSTA. 2. In my Reply #626, I provide some logic regarding 'Super Interglacial' periods (during the past 2.8 million years), this illustrate how we might reach GMSTA conditions similar to point 'C' (for Mid-Pliocene) in the first image, which might then trigger an abrupt collapse of the WAIS beginning circa 2040 (per DeConto, Pollard & Alley 2018). 3. The first linked article discusses similarities between probable modern climate forcing pathways and Mid-Miocene conditions (between 15 million and 17 million years ago and point 'D' on the first image, and see the second image), and the associated following extract provides a few reasons why we should not be complacent about the possibility of reaching such conditions, and warns that without appropriate precautions we might be heading towards end-Permian conditions. Title: " Why the Miocene Matters (and doesn’t) Today"
• Because greenhouse forcing is a log function of CO2 concentration, the Miocene increase in radiative forcing was much smaller than the increase since the industrial era to today, let alone levels projected by the end of the century. The Miocene increase from 400 to 500 ppm is a radiative forcing increase of about 1.2Wm-2, which is much less than the modern jump from 280ppm to 400ppm today, already a radiative forcing increase of 1.9Wm-2 (it’s really 2.9Wm-2 including other greenhouse gasses) let alone 6.0 Wm-2 for the IPCC’s RCP6.0 scenario (CO2 670 ppm), and 8.5 Wm-2 for the IPCC’s RCP8.5 business-as-usual scenario (CO2 936 ppm) by the year 2100 (figures from IPCC AR5). • Animals of the Miocene had no cities, no agriculture, no power stations, factories, roads or rail networks. They could migrate and spread as their environment altered on a pace very slow compared to their reproduction rate. • The Miocene saw reforestation of arid lands which may have mitigated some of the CO2 rise and warming, whereas we have been deforesting the planet for millennia, removing an important carbon sink that was available to the Miocene but not to us. • Our oceans are currently acidifying much faster than in the Miocene or any time in the last 60 million years – a sign of how much more rapid and how far out of equilibrium with short term carbon sinks our modern climate system is. • The MMCO global warming took place over many millennia, giving life time to adapt and migrate. Our warming is at least a thousand times faster, a rate that, if left unchecked, could well result in a climate that more resembles the end-Cretaceous or end-Permian disasters, rather than the relatively gentle MMCO. 4. The second linked article contrasts possible modern pathways with the hyperthermals (starting about 56 million years ago, and see the third image), which highlights the risks of potential abrupt emissions of methane (including in our case from the permafrost & thermokarst lakes) and carbon emissions from peat (including in our case from Indonesia and the Congo). Title: "Hyperthermals: What can they tell us about modern global warming?" Extract: "Around 50m years ago, Earth was struck by a series of short-term phases of rapid global warming, known collectively as “hyperthermals”. Lasting for a few thousand years at a time, each hyperthermal saw the world’s temperatures rise by as much as 5C. This rise in global temperature is believed to have caused widespread changes to some of the world’s habitats and waves of species extinctions. These hyperthermals were entirely natural climatic events, driven by large releases of gases, such as CO2 and methane, into the atmosphere. The likely causes of these events are still disputed by scientists, with some suggesting waves of volcanic eruptions, releases from natural methane stores and changes to the world’s soils could have been responsible. The rate of CO2 release during the hyperthermals was much slower than the rate recorded by scientists today. However, climate scientists hope that getting a better understanding of these past events could tell us more about how human-driven emissions might affect the planet in the coming century. A number of scientists believe that the hyperthermal that is most comparable to current climate change is the Paleocene–Eocene Thermal Maximum (PETM), which was the first and largest of all the hyperthermals. “One thing to keep in mind is the climate sensitivity that we may be dealing with in this century, only includes processes that are active on a timescale of maybe centuries or less. If you look at the PETM, there the timescale is probably order of millennia. Over thousands of years, you have different feedbacks. “By looking at the PETM, we can look at a lot of feedbacks that were active at this timescale. These could be the feedbacks that we may need to worry about in the future.”"
Title: "The Effects of Ocean Freshening on Marine and Atmospheric Circulation: Impacts and Solutions"
Extract: "As studied by Piana (n.d.), should the SST rise by 1°C, the tropopause’s temperature would increase by around 7.5°C. If the equatorial SST were raised from the average 27°C to 32°C then the tropopause would be heated 37°C above average. A 5°C SST increase, combined with other factors, would hypothetically cause the Hadley cells to increase in height allowing them to reach the poles. This effect terminates Ferrel and Polar cell convection and replaces it with a large Hadley cell (Figure 5). This causes global climates to become more equable than previously existed as temperatures are more evenly distributed across the globe (Piana n.d.)." Caption for the fourth image: "Figure 5: a. This shows the Hadley, Ferrel, and Polar Cells in the troposphere. For a Hadley cell warm air rises near the equator and falls after cooling at 30° latitude, creating a convection cell. b. This illustrates a single large Hadley cell due to increased SST (Hagerman design)." Title: "How Google, Microsoft, and Big Tech Are Automating the Climate Crisis"
Extract: "In a deal that made few ripples outside the energy industry, two very large but relatively obscure companies, Rockwell Automation and Schlumberger Limited, announced a joint venture called Sensia. The new company will “sell equipment and services to advance digital technology and automation in the oilfield,” according to the Houston Chronicle. Yet the partnership has ramifications far beyond Houston’s energy corridor: It’s part of a growing trend that sees major tech companies teaming with oil giants to use automation, AI, and big data services to enhance oil exploration, extraction, and production." Title: "Sharp rise in methane levels threatens world climate targets"
Extract: "Dramatic rises in atmospheric methane are threatening to derail plans to hold global temperature rises to 2C, scientists have warned." Atmospheric methane grew very rapidly in 2014 (12.7±0.5 ppb/yr), 2015 (10.1±0.7 ppb/yr), 2016 (7.0± 0.7 ppb/yr) and 2017 (7.7±0.7 ppb/yr), at rates not observed since the 1980s. The increase in the methane burden began in 2007, with the mean global mole fraction in remote surface background air rising from about 1775 ppb in 2006 to 1850 ppb in 2017. Simultaneously the 13C/12C isotopic ratio (expressed as δ13CCH4) has shifted, in a new trend to more negative values that have been observed worldwide for over a decade. The causes of methane's recent mole fraction increase are therefore either a change in the relative proportions (and totals) of emissions from biogenic and thermogenic and pyrogenic sources, especially in the tropics and sub‐tropics, or a decline in the atmospheric sink of methane, or both. Unfortunately, with limited measurement data sets, it is not currently possible to be more definitive. The climate warming impact of the observed methane increase over the past decade, if continued at >5 ppb/yr in the coming decades, is sufficient to challenge the Paris Agreement, which requires sharp cuts in the atmospheric methane burden. However, anthropogenic methane emissions are relatively very large and thus offer attractive targets for rapid reduction, which are essential if the Paris Agreement aims are to be attained. The rise in atmospheric methane (CH4), which began in 2007, accelerated in the past four years. The growth has been worldwide, especially in the tropics and northern mid‐latitudes. With the rise has come a shift in the carbon isotope ratio of the methane. The causes of the rise are not fully understood, and may include increased emissions and perhaps a decline in the destruction of methane in the air. Methane's increase since 2007 was not expected in future greenhouse gas scenarios compliant with the targets of the Paris Agreement, and if the increase continues at the same rates it may become very difficult to meet the Paris goals. There is now urgent need to reduce methane emissions, especially from the fossil fuel industry. Permafrost thaw in the Arctic enables the biogeochemical transformation of vast stores of organic carbon into carbon dioxide (CO2). This CO2 release has significant implications for climate feedbacks, yet the potential counterbalance from CO2 fixation via chemical weathering of minerals exposed by thawing permafrost is entirely unstudied. We show that thermokarst in the western Canadian Arctic can enable rapid weathering of carbonate tills, driven by sulfuric acid from sulfide oxidation. Unlike carbonic acid‐driven weathering, this caused significant and previously undocumented CO2 production and outgassing in headwater streams. Increasing riverine solute fluxes correspond with long‐term intensification of thermokarst and reflect the regional predominance of sulfuric acid‐driven carbonate weathering. We conclude that thermokarst‐enhanced mineral weathering has potential to profoundly disrupt Arctic freshwater carbon cycling. While thermokarst and sulfuric acid‐driven carbonate weathering in the western Canadian Arctic amplify CO2 release, regional variation in sulfide oxidation will moderate the effects on the permafrost carbon‐climate feedback. In the Arctic, perennially frozen ground (permafrost) in previously glaciated regions stores abundant minerals and is often ice‐rich. Therefore, this permafrost can rapidly thaw and collapse, resulting in thermokarst and exposing minerals to breakdown by chemical weathering. Mineral weathering by carbonic acid fixes CO2, making it less likely to enter the atmosphere. However, the effect of thermokarst on mineral weathering, carbon cycling, and rising atmospheric CO2 levels is unknown. We show thermokarst enhances weathering in streams in the western Canadian Arctic can rapidly produce significant and previously undocumented CO2 because carbonate weathering in this region is driven by sulfuric acid (from weathering of sulfide minerals) instead of carbonic acid. Long‐term river chemistry reveals that this weathering is intensifying as thermokarst accelerates. Across the Arctic, increasing thermokarst will profoundly impact freshwater carbon cycling, yet the influence of weathering on climate feedbacks will depend on regional variation in the mineral composition of permafrost soils. in the abstract the lower limit constraint is 680 and the upper limit constraint is 1260 ppm. If we reached an equitable climate condition, the near term pulse from permafrost alone (first 300 years) would push the atmosphere CO2 well above the median value of ~1000 ppm. The short version of this article is there has been a sharp rise in methane in the last decade and we don't know why. I don't like uncertainty as this does not allow us to identify an effective response. Thanks for noting that the EECO CO₂ range from Elliot et al (2015) was from 680ppm to 1,260ppm (with a mean of 970ppm); which is a useful guide even though the Earth Systems were much different in the EECO than now (e.g. the continents & oceans were different, and there were no ice sheets whose collapse could have contribute a major ice-climate feedback pulse, which is the potential case in coming decades ala Hansen et al 2016). 1. Current models indicate that most carbon emissions from permafrost degradation will be in the form of methane (with a 100-year GWP of 35). Thus even if full permafrost degradation only raises atmospheric CO₂ concentrations to 1,000ppm, the global warming potential of that degradation will be much higher than assumed by current ESM projections because of all of the emissions of short-lived methane. 2. As noted in the linked research, all current ESM projections do not account for the destabilization of marine layer clouds for CO₂ concentrations near 1,200ppm; which can abruptly increase ECS. Title: "High CO2 levels can destabilize marine layer clouds"
Extract: At high enough atmospheric carbon dioxide (CO2) concentrations, Earth could reach a tipping point where marine stratus clouds become unstable and disappear, triggering a spike in global warming, according to a new modeling study. This event—which could raise surface temperatures by about 8 Kelvin (14 degrees Fahrenheit) globally—may occur at CO2 concentrations above 1,200 parts per million (ppm), according to the study, which will be published by Nature Geoscience on February 25. For reference, the current concentration is around 410 ppm and rising. If the world continues burning fossil fuels at the current rate, Earth's CO2 level could rise above 1,200 ppm in the next century. The study could help solve a longstanding mystery in paleoclimatology. Geological records indicate that during the Eocene (around 50 million years ago), the Arctic was frost free and home to crocodiles. However, according to existing climate models, CO2 levels would need to rise above 4,000 ppm to heat the planet enough for the Arctic to be that warm. This is more than twice as high as the likely CO2 concentration during this time period. However, a warming spike caused by the loss of stratus cloud decks could explain the appearance of the Eocene's hothouse climate." Title: "Extreme CO2 levels could trigger clouds ‘tipping point’ and 8C of global warming"
There are so many sources for methane emissions (both anthropogenic & natural) up to 2100, that it would be hard to shake a stick at all of them, but the following linked research highlights the potential threat from future permafrost emissions of methane. Title: "Defusing the methane bomb—we can still make a difference"
Extract: "When the permafrost thaws, the soil microbes contained in the soil can turn the carbon into carbon dioxide and methane, which are both greenhouse gases that are known to contribute to global warming when released into the atmosphere. Unfortunately, this is exactly what is currently happening as a result of climate change. In fact, the massive amounts of methane that could potentially be released as a result of permafrost thaw, has often been described as a ticking time bomb and has long been a concern for climate scientists. Abstract: "Climate warming is expected to destabilize permafrost carbon (PF‐C) by thaw‐erosion and deepening of the seasonally thawed active layer and thereby promote PF‐C mineralization to CO2 and CH4. A similar PF‐C remobilization might have contributed to the increase in atmospheric CO2 during deglacial warming after the last glacial maximum. Using carbon isotopes and terrestrial biomarkers (Δ14C, δ13C, and lignin phenols), this study quantifies deposition of terrestrial carbon originating from permafrost in sediments from the Chukchi Sea (core SWERUS‐L2‐4‐PC1). The sediment core reconstructs remobilization of permafrost carbon during the late Allerød warm period starting at 13,000 cal years before present (BP), the Younger Dryas, and the early Holocene warming until 11,000 cal years BP and compares this period with the late Holocene, from 3,650 years BP until present. Dual‐carbon‐isotope‐based source apportionment demonstrates that Ice Complex Deposit—ice‐ and carbon‐rich permafrost from the late Pleistocene (also referred to as Yedoma)—was the dominant source of organic carbon (66 ± 8%; mean ± standard deviation) to sediments during the end of the deglaciation, with fluxes more than twice as high (8.0 ± 4.6 g·m−2·year−1) as in the late Holocene (3.1 ± 1.0 g·m−2·year−1). These results are consistent with late deglacial PF‐C remobilization observed in a Laptev Sea record, yet in contrast with PF‐C sources, which at that location were dominated by active layer material from the Lena River watershed. Release of dormant PF‐C from erosion of coastal permafrost during the end of the last deglaciation indicates vulnerability of Ice Complex Deposit in response to future warming and sea level changes." Extract: "The current anthropogenic climate warming is expected to increase both direct thermal forcing and a sea level rise of almost 1 m by the year 2100 (RCP 8.5; Intergovernmental Panel on Climate Change, 2014), both mechanisms may again lead to accelerated remobilization of permafrost carbon and enhanced release of greenhouse gases to the atmosphere." Methane emissions regulate the near‐term global warming potential of permafrost thaw, particularly where loss of ice‐rich permafrost converts forest and tundra into wetlands. Northern latitudes are expected to get warmer and wetter, and while there is consensus that warming will increase thaw and methane emissions, effects of increased precipitation are uncertain. At a thawing wetland complex in Interior Alaska, we found that interactions between rain and deep soil temperatures controlled methane emissions. In rainy years, recharge from the watershed rapidly altered wetland soil temperatures, warming the top ~80 cm of soil in spring and summer and cooling it in autumn. When soils were warmed by spring rainfall, methane emissions increased by ~30%. The warm, deep soils early in the growing season likely supported both microbial and plant processes that enhanced emissions. Our study identifies an important and unconsidered role of rain in governing the radiative forcing of thawing permafrost landscapes. Because the world is getting warmer, permanently frozen ground around the arctic, known as permafrost, is thawing. When permafrost thaws, the ground collapses and sinks. Often a wetland forms within the collapsed area. Conversion of permanently frozen landscapes to wetlands changes the exchange of greenhouse gases between the land and atmosphere, which impacts global temperatures. Wetlands release methane into the atmosphere. Methane is a potent greenhouse gas. The ability of methane to warm the Earth is 32 times stronger than that of carbon dioxide over a period of 100 years. In our study, we found that methane release from a thaw wetland in Interior Alaska was greater in rainy years when rain fell in spring. When spring rainwater entered the wetland, it rapidly warmed wetland soils. Rain has roughly the same temperature as the air, and during springtime in northern regions, the air is warmer than the ground. The microbial and plant processes that generate methane increase with temperature. Therefore, wetland soils, warmed by spring rainfall, supported more methane production and release. Northern regions are expected to receive more rainfall in the future. By warming soils and increasing methane release, this rainfall could increase near‐term global warming associated with permafrost thaw. Abstract: "Freshwater ecosystems are a major source of methane (CH4), contributing 0.65 Pg (in C02 equivalents) yr-1 towards global carbon emissions and offsetting~25% of the terrestrial carbon sink. Most freshwater CH4 emissions come from littoral sediments, where large quantities of plant material are decomposed. Climate change is predicted to shift plant community composition, and thus change the quality of inputs into detrital food webs, with the potential to affect CH4 production. Here we find that variation in phenol availability from decomposing organic matter underlines large differences in CH4 production in lake sediments. Production is a least 400-times higher from sediments composed of macrophyte litter compared to terrestrial sources because of inhibition of methanogenesis by phenol leachates. Our results now suggest that earth system models and carbon budgets should consider the effects of plant communities on sediment chemistry and ultimately CH4 emissions at a global scale." Abstract: "Several viable but conﬂicting explanations have been proposed to explain the recent ~8p.p.b.per year increase in atmospheric methane after 2006, equivalent to net emissions increase of ~25Tg CH4 per year. A concurrent increase in atmospheric ethane implicates a fossil source a concurrent decrease in the heavy isotope content of methane points toward a biogenic source, while other studies propose a decrease in the chemical sink (OH). Here we show that biomass burning emissions of methane decreased by 3.7 (±1.4) Tg CH4 per year from the 2001–2007 to the 2008–2014 time periods using satellite measurements of CO and CH4 nearly twice the decrease expected from prior estimates. After updating both the total and isotopic budgets for atmospheric methane with these revised biomass burning emissions (and assuming no change to the chemical sink), we ﬁnd that fossil fuels contribute between 12–19 Tg CH4 per year to the recent atmospheric methane increase, thus reconciling the isotopic- and ethane-based results. Title: "NASA-led Study Solves a Methane Puzzle"
Livestock play an important role in carbon cycling through consumption of biomass and emissions of methane. Recent research suggests that existing bottom-up inventories of livestock methane emissions in the US, such as those made using 2006 IPCC Tier 1 livestock emissions factors, are too low. This may be due to outdated information used to develop these emissions factors. In this study, we update information for cattle and swine by region, based on reported recent changes in animal body mass, feed quality and quantity, milk productivity, and management of animals and manure. We then use this updated information to calculate new livestock methane emissions factors for enteric fermentation in cattle, and for manure management in cattle and swine. Using the new emissions factors, we estimate global livestock emissions of 119.1 ± 18.2 Tg methane in 2011; this quantity is 11% greater than that obtained using the IPCC 2006 emissions factors, encompassing an 8.4% increase in enteric fermentation methane, a 36.7% increase in manure management methane, and notable variability among regions and sources. For example, revised manure management methane emissions for 2011 in the US increased by 71.8%. For years through 2013, we present (a) annual livestock methane emissions, (b) complete annual livestock carbon budgets, including carbon dioxide emissions, and (c) spatial distributions of livestock methane and other carbon fluxes, downscaled to 0.05 × 0.05 degree resolution. Our revised bottom-up estimates of global livestock methane emissions are comparable to recently reported top-down global estimates for recent years, and account for a significant part of the increase in annual methane emissions since 2007. Our results suggest that livestock methane emissions, while not the dominant overall source of global methane emissions, may be a major contributor to the observed annual emissions increases over the 2000s to 2010s. Differences at regional and local scales may help distinguish livestock methane emissions from those of other sectors in future top-down studies. The revised estimates allow improved reconciliation of top-down and bottom-up estimates of methane emissions, will facilitate the development and evaluation of Earth system models, and provide consistent regional and global Tier 1 estimates for environmental assessments. "How will the atmosphere, ocean and sea-ice systems mediate sources of sea-level rise from the Antarctic ice sheet over the next 30 years?" Extract: "Global Mean Sea-Level (GMSL) rise remains one of the most impactful and uncertain consequences of a warming climate. While the Fourth National Climate Assessment Special Science Report adopted projections of GMSL rise by 2100 in the range of 30 cm to 120 cm, the possibility of GMSL rise of ~240 cm could not be excluded (USGCRP, 2017). As the costs associated with sea-level rise increase nonlinearly with GMSL (Boettle et al., 2016), the probabilities of future GMSL at the high-end tails carry outsized economic impacts. E3SM is uniquely positioned to better constrain the high-end estimates of future GMSL, which is dominated by uncertainties associated with rapid, unstable collapse of the West Antarctic ice sheet (the “marine sheet instability”; Schoof, 2007). Constraining projections of GMSL requires progress along two fronts: (1) an accurate representation of the relevant ice-sheet-climate forcings, and (2) a robust coupling of dynamic ice sheet models to those forcings within the coupled Earth system. While the latter is being addressed through the SciDAC ProSPect project, the former will be a focus of the project’s v2 cryosphere science campaign. Specifically, the focus will be on evaluating and improving the representation of the climate forcings that can rapidly melt ice shelves from below (the ocean) and above (the atmosphere), thereby increasing the likelihood of unstable ice sheet retreat. This goal is distinct from the ProSPect project, which focuses mainly on developing a dynamic ice sheet model and its coupling to other Earth system components. Theory, observations, and modeling all support the hypothesis that rapid and unstable retreat of the majority of the West Antarctic Ice Sheet, and parts of the East Antarctic Ice Sheet, can occur following the collapse of its fringing ice shelves (Schoof, 2007; Scambos et al., 2000; Cornford et al., 2016). Collapse of the ice sheet would emerge due to a set of complex, coupled physical processes involving the atmosphere, ocean, and sea ice systems. One of the largest sources of uncertainty with respect to abrupt GMSL rise is from sub-marine melting of ice shelves associated with relatively warm ocean water intrusions onto the Antarctic continental shelf (USGCRP, 2017). Melting at the ocean-land ice interface depends on the efficiency of the ocean-ice heat exchange: how much heat can be brought into the ice shelf cavities, and how much heat can be extracted from the ocean to melt ice within the ice shelf cavities? The former depends strongly on the structure and position of water masses in the Southern Ocean, particularly the location and outcropping of the relatively warm Upper Circumpolar Deep Water (UCDW). The latter depends on both the structure and evolution of the near-coast currents, such as the Antarctic Slope Front Current (Stewart and Thompson, 2013; Stewart and Thompson, 2015) and Antarctic Coastal Current (Spence et al., 2014). In addition, the flux of freshwater at the ocean-land ice interface is extremely sensitive to the strength and structure of the sub-ice ocean circulation, as well as the areal extent of the land ice interface. Atmospheric winds in the Southern Hemisphere play a leading role in determining the outcropping location of UCDW and, more broadly, in setting the structure of Southern Ocean water masses (Hallberg and Gnanadesikan, 2006). At hemispheric spatial scales, biases in the surface westerlies drive anomalous ocean water upwelling leading to incorrect outcropping of UCDW. At much finer spatial scales typically not resolved in ESMs, persistent katabatic winds drive the formation of coastal polynyas which, in turn, produce Antarctic Bottom Water (AABW; Tamura et al., 2008) that, in large part, sets the global ocean circulation and mediates the flow of warmer waters onto the continental shelf. There is strong evidence that the Antarctic ozone hole has increased wind speeds at the ocean surface around Antarctica (Solomon et al. 2015; Thompson et al. 2011), which will presumably then affect sea-ice concentration and distribution and upwelling of warm intermediate depth waters that impact ice-shelf melting. The atmosphere also impacts ice shelf integrity via the “surface mass balance” (SMB). For Antarctica, SMB is currently positive almost everywhere throughout the year (van de Berg et al., 2006). However, warm air intrusions can generate substantial surface melt on flat, low lying ice shelves, as documented by the ARM West Antarctic Radiation Experiment (AWARE) in January 2016. Surface melt ponding in small fractures and larger crevasses can lead to the process of “hydrofracture,” whereby water-filled crevasses penetrate the full-thickness of ice shelves, eventually leading to their collapse (Scambos et al., 2000; Banwell et al., 2013), such as the collapse of the Larsen B ice shelf in 2002 (Glasser and Scambos, 2008). Like the atmosphere, sea ice processes strongly modify the structure of water masses in the Southern Ocean (Abernathey et al., 2016) and mediate ocean-land ice melt. Water mass modification occurs directly through the redistribution of freshwater and indirectly by shielding the ocean from the atmospheric surface winds. Southern hemisphere sea ice is almost entirely seasonal and this seasonality results in a net poleward transport of ocean heat. In addition, during the seasonal, sea-ice life cycle, the ice intercepts atmospheric precipitation that also tends, on average, to move freshwater equatorward. In terms of impacting ocean-land ice melting, sea ice also plays a critical role of attenuating or even completely shielding the ocean from atmospheric wind stress in and near coastal regions (Dinniman et al., 2011). Slight changes in sea-ice coverage lead to substantial changes in the amount wind stress applied to the ocean surface that, in turn, can determine whether UCDW enters sub-ice cavities and induces ice melt (Dinniman et al., 2012, Hellmer et al., 2012). Given the challenges in modeling the ocean, atmosphere, and sea ice forcings that influence the Antarctic Ice Sheet, our v2 cryosphere systems simulation campaign will use a combination of coupled and uncoupled simulations to understand and reduce biases of the climate forcings for the ice sheet and perform numerical experiments to delineate how the atmosphere, ocean, and sea ice mediate the contributions of the Antarctic Ice Sheet to sea-level rise in the near future." Title: "Status of E3SM Simulation Campaigns"
Title: "From the Program Manager: February 2019"
Extract: "The E3SM project is settling into phase 2 of the project, while also expanding its deployment to a broader research community." 1. Various ice-climate feedback mechanisms are already being activated, including impacts on MOC, ENSO and the upwelling of CDW. 2. Consensus science has underestimated the impact of anthropogenic aerosols on GMSA, which implies that as anthropogenic aerosol emissions are both reduced and redistributed geographically, GMSTA will likely increase faster than expected. 3. La Nina events have already become less frequent, which is reflected by the current positive Nino 3.4 index and the forecasted El Nino event this year. 4. Wildfires and land use changes are currently contributing more to climate change forcing than assumed by the Paris Pact. 5. Most participants in the Paris Pact are not currently making adequate progress towards meeting their commitments. 6. While most terrestrial and oceanic carbon sinks are still functioning; many of these sinks could become carbon sources within the next twenty to thirty years. 7. Cascading of positive feedback mechanisms can be expected to accelerate within the next twenty to thirty years. Page created in 0.043 seconds with 28 queries.